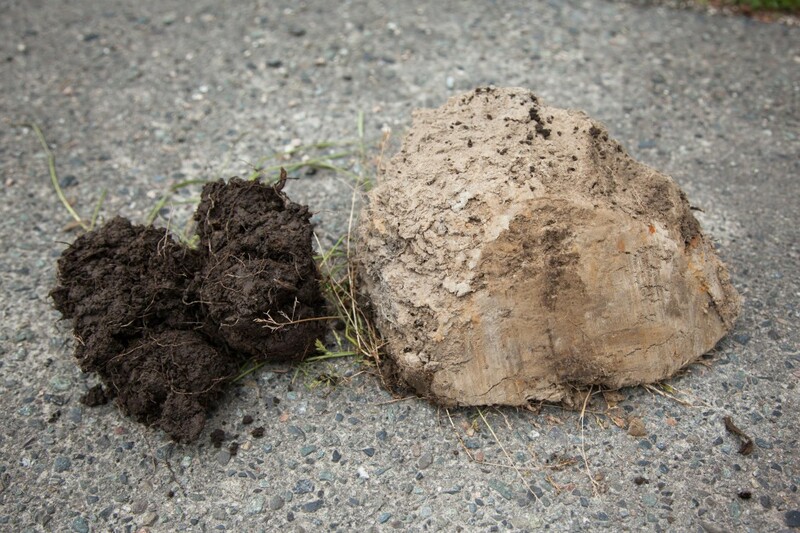 When my husband and I purchased a plot of land in Langley in 2013, we ran into a problem that thwarted our farming plans almost immediately: there was no topsoil here—it had been quarried decades ago and never remediated. Our neighbour embarked on a program with Environmental Services to truck in fill and topsoil from a local site. We watched them trucking in dirt for years. The whole thing seemed like a ridiculously resource-laden practice. Not only that but no one really knew where the material was coming from or how it had been treated previously. With hopes and aspirations of creating a natural and organic growing medium we decided not to follow suit and problem solve another way. Knowing we couldn’t grow veggies in the majority of our fields, we decided to focus on livestock and purchased four heritage piglets. We had about an acre that we wanted them to “fix” but knew that we had to manage them in a way that mimicked nature to utilize them as a resource and so we began strip grazing them across our field. The piglets would intensively graze a small area for a short time and then be moved to new pasture, much like a grazing wild herd of animals. We watched in wonder as they foraged, ate weeds by the roots, turned over our land to create a deep soil and fertilized as they went. The added bonus was that we got bacon as a bi-product! We were converts and knew that we had to develop this amazing resource as a permanent feature of the farm. 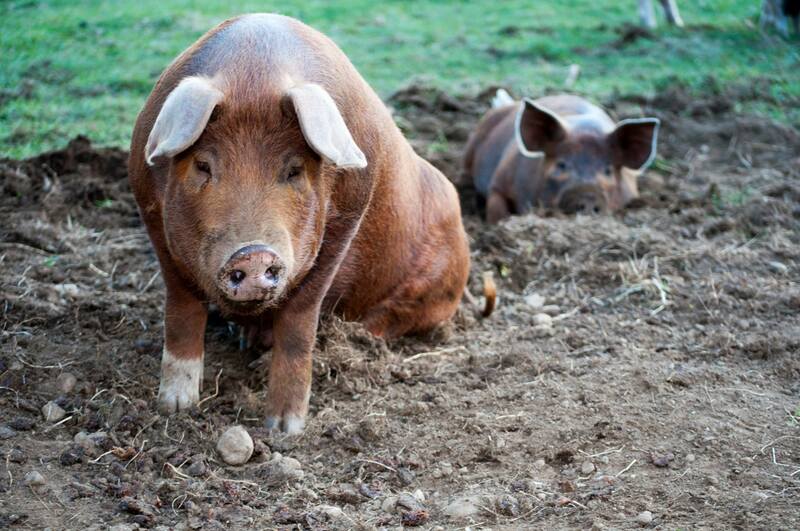 We knew we had to manage our pigs in a way that mimicked nature to utilize them as a resource. Fast forward five years and we have our own breeding stock, piglet nursery and, most importantly, a delicate, three-tiered, rotational grazing system that involves pastured pigs, vegetable production and cover crops with all the resources we need being generated here by our beloved pigs. 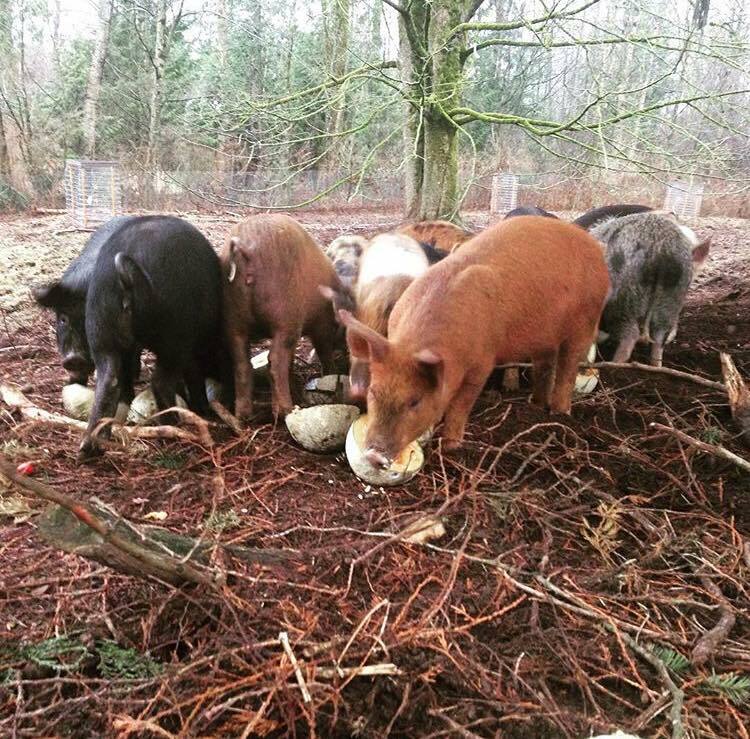 And there’s so much more to our story of regenerative agriculture—I’ve only touched on the benefits of the pigs here but, in short, they have become an integral part of our complex farming tapestry. 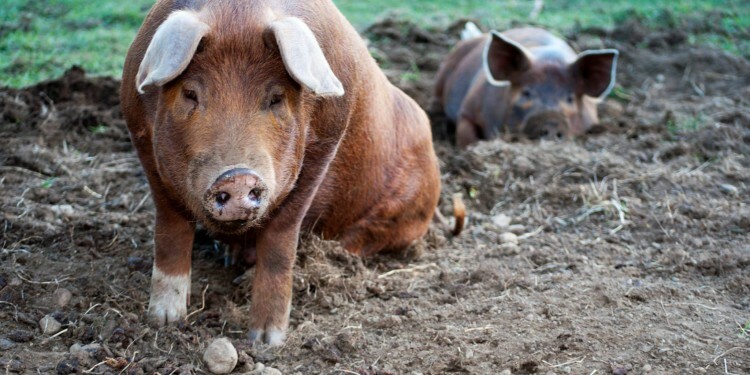 As newbie farmers, and as we faced more challenges and negativity about animal agriculture, we wanted to learn more about the wonderful world of the porcine and took to the internet to better aid our understanding. We delved into countless studies about using cattle as part of a regenerative agriculture model, and listened to Joel Salatin wax lyrical about “pigness of the pigs”, but we found very little in the way of evidence-based studies on the benefits to the land and environment as a direct result of pasturing pigs. Introduce Corine Singfield into our lives. Corine had been working as a Farm Manager of KPU’s Farm School. Two years ago, they planted cover crops over six acres of land. They started grazing their pigs intensively, applying the rules of conservation tillage which stipulates that 30% of ground coverage should remain at all times. At that point, the pigs had disturbed the soil in a way in which sheep or cattle don’t and were moved on to fresh pasture. Corine and her team of students broadcast a second cover crop without any additional tilling. Because the pigs had been moved after a relatively short amount of time, there were still roots from the initial cover crop in the soil decomposing and serving as a habitat for beneficial species of fungi and bacteria that only thrive in undisturbed soils—a naturally occurring benefit that is lost by mechanical tillage, which also releases carbon and damages the integrity of the soils. All this was happening in the middle of a very busy summer season, and so they didn’t get time to run the pigs over the entire six acres and the rest of the land was managed by tractor and mechanical input. Purely out of interest, Corine kept records of where the pigs had grazed and so by the time the following spring arrived, they were able to make some visual assessment of the land and gather some baseline data. The first thing Corine observed was water poolage over the parts of the field that had been mechanically tilled—a clear indication of compacted and unhappy soils. Corine took soil samples which confirmed that the soil that had been mechanically tilled had “massive structure”, the condition of a soil layer in which the layer appears as a coherent or solid mass. It’s not hard to understand that roots would struggle to move through soil like this. The pig-managed soil showed the total opposite. Corine was delighted to find loose, crumbly soil teaming with animals and bacterial biology. Corine, like most farmers would be, was disproportionately excited about these soil contrasts and took them to her boss, Kent Mullinix. They were interested in comparing agronomic practices so agreed to gather further observational and anecdotal evidence by planting a brassica crop across both samples of land. At the end of the season, Corine reported that the greens from the pig-grazed sections were a darker green, had higher yields, the root mass was twice as big, and perhaps most significantly, lacked the predator damage the other sample had sustained. Loathed to keep these findings to themselves, Corine submitted a pitch to the Organic Federation of Canada on behalf of KPU Farm School and was successful. The project was accepted and championed by the Organic Federation but then denied by the Federal Government (AAFC) on the premise that it only applies to small-scale agriculture, citing “the commercial value of the project could be limited if only applicable to small scale operations”. Kwantlen Polytechnic Farm School are pushing on regardless into the first year of a three-year study without the support of outside agencies. It’s incredibly disappointing, and dare I say short-sighted and discriminatory, that Government support is not forthcoming. A valuable study that will put some solid structure around KPU’s “experiment” and provide the farming community with some evidence-based data that, in my opinion, would be applicable to any size farming model. Throughout this piece of work, Corine and her team will be documenting by video with a view to taking a presentation on the road to other farmers, writing a manual, and hosting two workshops per year to disseminate the findings and best practices—practices that promote integrated farms as the most sustainable closed-loop agroecosystem. These very farming practices that used to be the basis of all food production, perfected over centuries, were almost wiped out in just 50 years of industrialization. An accidental observation turned evidence-based study—a study with outcomes that will guide many of us on how best to manage our pigs; outcomes that will help us defend our livelihood against a growing population that is generally misinformed about animal agriculture. But, most importantly, we will receive guidance on how to integrate our practices while reducing our dependence on fossil fuels, tillage, and help with carbon sequestration. And all this pioneered right here in BC! Exciting Ag Possibilities! Or Am I Kidding Myself?